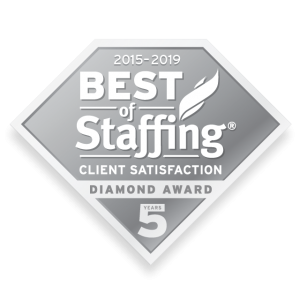 KALAMAZOO, MI – MARCH 25, 2019 – Workforce Strategies, Inc. (WSI), a leading staffing agency in Michigan, Indiana, and Ohio, announced today that they have earned ClearlyRated’s Best of Staffing® Client Diamond Award after winning the Best of Staffing Client Award at least five years in a row for providing superior service to their clients. Focused on helping industrial companies find the right people for their job openings through innovative and custom solutions , WSI received satisfaction scores of 9 or 10 out of 10 from 65% of their clients, significantly higher than the industry’s average of 35%. With fewer than 2% of all staffing agencies in the U.S. and Canada earning the Best of Staffing Award, just 35% of the 2019 Best of Staffing winners earned the Diamond Award distinction. The winners of this award truly stand out for exceeding client expectations. “Our commitment to providing exceptional service to our clients and associates not only makes WSI better, but it improves the staffing industry as a whole. I am incredibly proud of the entire organization because everyone’s dedication and commitment to excellence allows us to be recognized in this way,” WSI President/CEO, Jeffrey O’Brien said.